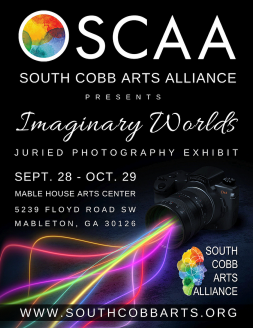 POWDER SPRINGS, Ga. - Aug. 31, 2018 - PRLog -- The South Cobb Arts Alliance (SCAA) is pleased to announce their "Imaginary Worlds" Photography Exhibition. The exhibition opens at the Mable House Arts Center (5239 Floyd Road SW, Mableton, GA 30126) on Friday, September 28th, with a reception and awards ceremony being held on Saturday, September 29th, from 5:00 – 7:00 p.m. The exhibit runs through October 29, 2018. Regarding this exhibit, the SCAA shares, "In our much-anticipated upcoming exhibition entitled 'Imaginary Worlds,' we challenge the artist to utilize digital technology to alter their original photographic image to create unique and impossible realities. Picture a world of fantasy…an escape from real life limited only by your imagination and your technical skills. It can be a world created from a single digitally-manipulated photograph or a composite of multiple images. If you can imagine it, you can create it!" Awards to be assigned are as follows: First Place; $250.00, Second Place; $125.00, and Third Place; $75.00. Judge for this exhibition is photographer John Mariana. John began his career using photography in connection to his art background to create color images, and by 1984, black and white prints became his specialty. Today, John uses photography to create fine art black and white and color prints expressing his thoughts and artistic vision. He utilizes medium format, large format negatives, and digital files to bring a new and different look to his work. From his early art training, he developed a uniqueness of composition, contrasts, colors, and tones, with formal art courses continuing through his undergraduate studies. The artistic training combined with photography gave his images a unique visual and emotional presentation. Mariana's current works include color prints, black and white prints, warm brown sepia-toned prints and hand-tinted prints. Mariana was President of the Chicago Area Camera Clubs Association in 1990. The organization consisted of 40 clubs in the greater Chicago metropolitan area. He became the Chairman of the Chicago Area Photographic School from 1986 to 1990 and co-founded the not-for-profit American Photographic Academy, which is dedicated to education in the art of photography. He additionally founded ambient light workshops to provide in-the-field and darkroom education and conducts workshops in the U.S. and other countries. The mission of the South Cobb Arts Alliance is to build the community by encouraging appreciation and active participation in the visual arts, performing arts, and local heritage. The SCAA strives to advance to high levels the artistic standards of their members, their community, and the public by offering opportunities to extend experiences, to increase skills, and to share understanding, philosophy, techniques, and knowledge. The SCAA supports the arts in all mediums and seeks to develop and present innovative programs that enrich their community. Since 1972, South Cobb Arts Alliance has presented the South Cobb neighborhoods with hallmark events celebrating the arts and opening doors to those in our community who might otherwise not partake in the arts. The majority of South Cobb Arts Alliance events are at no cost or discounted to the participants and attendees. SCAA is a 501(c)(3) non-profit organization that encourages and invites the community to join their membership and become a part of their energetic and diverse group of volunteers and supporters. Membership dues and donations are tax-deductible. For more information on South Cobb Arts Alliance, visit the website at www.southcobbarts.org. For media inquiries, interviews, etc., contact scaaorg@gmail.com or phone 864-571-0597. The South Cobb Arts Alliance Presents 2 Holiday Arts and Crafts Shopping Events! South Cobb Arts Alliance Launches Arts Publication Artistic Connections!